Railing and fence designs can range from simple to the very ornate as dictated by customer preferences. 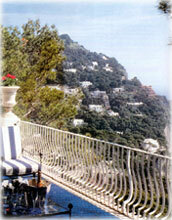 Railings can be produced for indoor or outdoor use. Indoor railings can be fitted with brass or wooden embellishments and require only finish paint. Outdoor railings and fences are first treated for rust protection and then they are coated with finish paint. The options available for rust protection are: shop primer, zinc rich coating, powder coating or hot dip galvanizing. Railings are usually comprised of several components including: hand rails, newel posts, and balusters, the latter to fill the gaps between the posts. Handrails can be plain or furrowed or they can be selected with hammered edges or elaborate designs carved on the surface. Balusters are available in a number of different styles including: plain, twisted, curved or wavy. Balusters are also available complete with different design elements including: baskets, bushings, scrolls, leaves and many others. In the following pages you will see only a small sample of the railings that can be manufactured using some of the components and design elements mentioned above. Please keep in mind that railings can be custom designed according to any individual preferences or specifications and we encourage our customers to be as creative as they want. For a larger selection of railing designs or to see some actual railings in person please visit our showroom. To view a sample of railings and fences, click here.